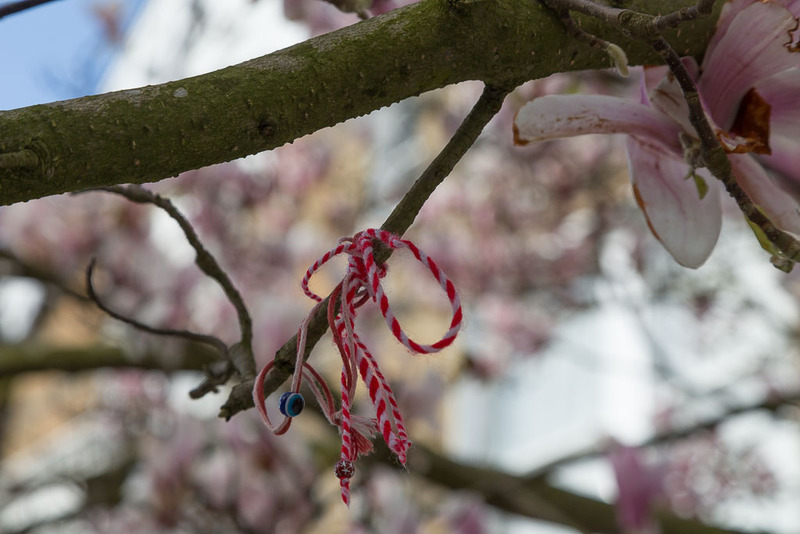 For years now I've noticed bits of white and red twine tied to blooming trees in springtime. I never quite knew where this tradition came from or what it meant. I think I remember seeing it in New York, too. The bits of "spring string" in these two photos are fastened to a magnolia on my walk to work. Here's another on a different tree from 2014. Apparently it's a tradition from the southern Balkans. In Bulgaria, the ornaments are called "martenitsi" and according to the ever-dependable Wikipedia, they often take the form of two dolls. Simpler woven bracelets and ornaments are common too. Sometimes they come with beads, as you can see above. I learned about them after I posted the photo above, taken on my walk near Canary Wharf several weeks ago, to Flickr. Someone immediately identified it as a martenitsa. 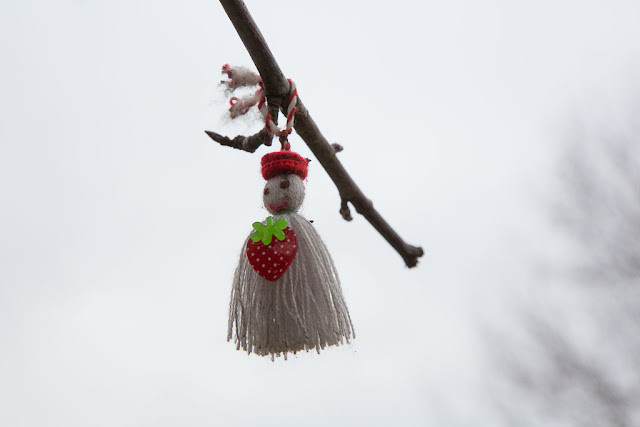 Apparently they are worn until the wearer sees a first sign of spring -- like a blooming tree -- at which point they're taken off and tied to the tree as a sign of good fortune. I am not an expert in any of this, mind you, having just learned about them myself. This is just what I could glean from the Interwebs. Pretty interesting, huh? Yesterday I spent the day immersed in database usage statistics at work. Doesn't that sound exciting?! I'm supposed to compile annual reports showing how much our databases have been used during the previous school year, but I confess I'd slacked off -- I knew I'd skipped at least one year, but it turns out I skipped two. (Perhaps it should give me pause that no one noticed!) So I got caught up on all that, which is a relief. I have managed to establish e-mail contact with Mrs Kravitz. I won't tell you what she said about the bin locks. It would simply be too upsetting. She admits that she did indeed throw her leftovers into your garden in a "purple rage" induced by excessive vodka consumption. In a further development, because of the bin locks, she is seriously considering buying a drum kit. That string Tradition is lovely. Spring can be so brief here in the Desert, but I thoroughly enjoy the signs of it since the Desert likes to explode in Wildflowers during the brief time that it can. Very funny, Mr. Pudding. You're quite the Yorkshire E F Benson. My first thought about the string was, I wonder if the trees like it? I have a Japanese dogwood tree in my yard, planted by the former owner of my 100-year old house, and it had a string, or a very thin rope, tied onto one of its branches (there was probably a wind chime hung there) and now the poor tree has out-grown the string and is oozing bark around it. I believe that trees have feelings (but I've read that most of their soul is in their roots) and this poor tree's branch has an in-grown string that I hope isn't causing it too much discomfort. I love that string/spring idea. It's lovely. Database usage statistics? Yeah. That sounds like a very worthwhile thing to do with your time. And seriously- two years and no one noticed? So foxes are the opposite of vegetarians, eh? Maybe that fox has a gluten intolerance. Martinesta may be interesting by the way they welcome spring but I wonder about the origin of the tradition. Steve, you are sending me to the internet to do some homework. why red and white I wonder? I enjoyed that image of Mrs. Kravitz in purple rage! Interesting tradition you've described. I have never heard of it before and I don't believe I've seen any evidence of it on the trees here. When we lived in Mexico, there was a total solar eclipse one year. Our yard man brought strips of red cloth and tied one to each of our fruit trees "so the fruit won't drop". None of it did, so maybe his superstition was correct! I see those strings on trees in New York City too, and never knew what they were. You've educated me! I don't think I've ever seen strings like that anywhere. Mmm... maybe I'm not looking carefully enough. YP: Tell her, "BRING IT ON!" Vivian: I wondered that too! 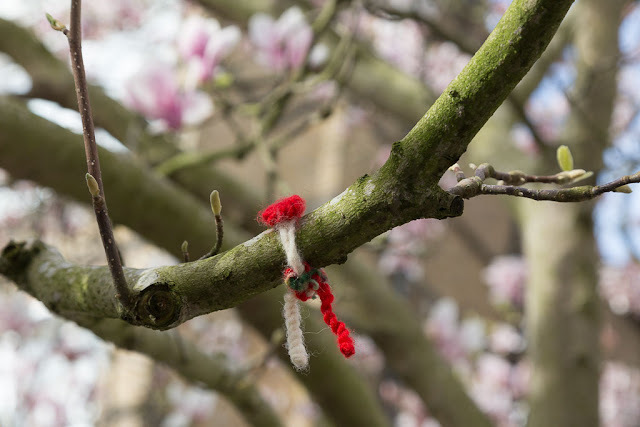 I suppose in the old days the string would just rot off before any harm could come to the tree, but with today's synthetic fibers, who knows. Ms Moon: I suppose if no one noticed AND I thought it was useless information, I'd be daunted. But I do think it's probably wise to keep track of our database usage, so we can decide which services are worthwhile and which aren't. That's a decision we only make once a year, at subscription time, if we reconsider it at all. Red: I saw a couple of different explanations for the red/white color scheme. I'm glad I inspired you to read further! Maybe you'll get a more definitive answer than I did. Ellen: There are several reasons out there, having to do with purity and life or something like that. Sharon: Maybe you don't have many Bulgarians in Phoenix! Catalyst: Wow! That's an interesting reaction to an eclipse! What a great story. 37P: I thought I'd seen them in NY! In fact, if I dig around I probably have old pictures of some. I always thought it was a Japanese thing because I used to see them on cherry trees, and I know cherry blossoms figure prominently in Japanese culture. Robin: I bet if you go to San Fran or another large urban area you might see some.